On Nov. 15, 1864, after destroying Atlanta and cutting his communications with the North, Maj. Gen. W.T. Sherman, USA, began his destructive Campaign for Savannah - the March to the Sea. He divided his army [US] into two wings. The Left Wing (14th and 20th Corps), Maj. Gen. H.W. Slocum, USA, moved east from Atlanta in two columns which converged on Milledgeville, crossed the Ogeechee River near Louisville, then marched toward Savannah by two routes: the 14th Corps (Davis) on the old road near the Savannah River (Ga 24), the 20th Corps (Williams) via Springfield. Both corps approached Savannah via Monteith. Gen. Sherman accompanied the Left Wing as far as Sandersville. the Ogeechee River and Gen. Sherman's headquarters were established here in Burton. That night, the depot and other railway facilities were completely destroyed. Next morning, the 17th Corps moved east on the present Ga 17, which it followed to Savannah. That night, it camped at Herndon Station 9, CRR, after stripping the country of provisions. Location. 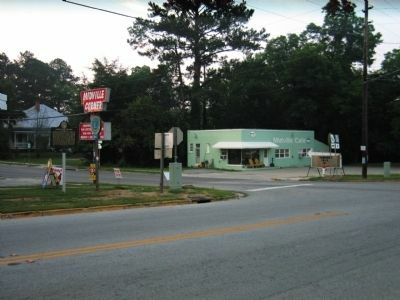 32° 49.157′ N, 82° 14.082′ W. Marker is in Midville, Georgia, in Burke County. 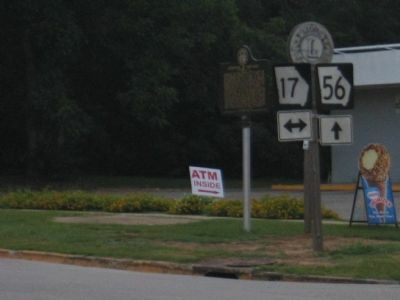 Marker is at the intersection of Jones Street (Georgia Route 56) and Lee Street (Georgia Highway 17), on the right when traveling north on Jones Street. Touch for map. Marker is in this post office area: Midville GA 30441, United States of America. Touch for directions. (approx. 5½ miles away); Summerville (approx. 5.6 miles away); The Savannah Road (approx. 5.9 miles away); Old Town Plantation (approx. 7.9 miles away). Touch for a list and map of all markers in Midville. More about this marker. This is a recreation of the missing 1958 Georgia Historical Commission marker, installed in 2010. 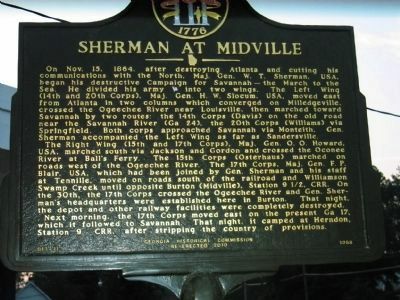 It is part of the Georgia Historical Society's new (2010)program to replace missing markers documenting Sherman's March to the Sea. More. Search the internet for Sherman at Midville. Credits. This page was last revised on June 16, 2016. This page originally submitted on June 26, 2010, by Robert Hill Powers of Midville, Georgia. This page has been viewed 1,536 times since then and 25 times this year. Last updated on July 2, 2010, by David Seibert of Sandy Springs, Georgia. Photos: 1, 2, 3. submitted on June 26, 2010, by Robert Hill Powers of Midville, Georgia. • Craig Swain was the editor who published this page.